Is there no balm in Gilead, is there no physician there? Why then is there no recovery for the health of the daughters of my people? (Jeremiah 8:22). 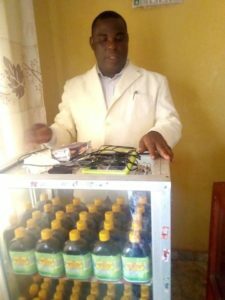 The Rhema Balm of Gilead Herbal Juice/Wine and Food Supplement is purely a divine recipe given to Rev. (Dr.) Evang. Timothy Osemudiamen Okhomhen, the President of the Rhema Interdenominational Ministry for almost three weeks’ revelation. God told him, “I want to shame Satan and his cohorts through your life and reveal My power through your ministry.” He further told him that right from immemorial He had been in the business of using the foolish things of this world to shame the wise; therefore, I have decided to use this Food Supplement to shame the devil and his cohorts. This Food Supplement is a combination of the following herbs in a larger quantity with a divine formula as revealed by God: Garlic, Ginger, Lemon, Lime, Moringer, Papaya leaf (Pawpaw), Aloe-Vera, Mustard Seed and Pure Undiluted Honey. God further told him that you are going to be hearing of different incurable ailments that I am going to be using this Food Supplement to heal in the life of people and that had been the testimony of many today. In the Bible: herbs, fruits, and vegetables were God’s recommendation for the nations’ healing (Revelation 22:2). Therefore, God’s recommendation can never be compared to man’s recommendation by any standard. This Food Supplement works round the whole body system to keep one fit, strong and healthy. The heart is the engine room of the human body; therefore, when the heart is sound the body will be healthy. The Rhema Balm of Gilead Herbal Juice/Wine keeps the heart sound and vibrant to function ultimately in the human body. It has been tested and verified. It is purely natural without no artificial or chemical. It has no single side effect. It is very good for both adults and children. 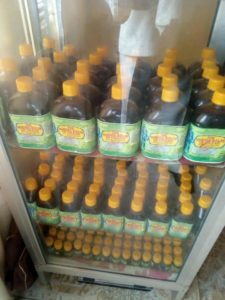 It is a very good remedy to the following ailments such as: Arthritics, Rheumatism, Diabetics, Blood Pressure (BP), Malaria and Typhoid/General Fever, Pile/Fibroid, Sexual/Toilet Infections, Libido/Watery Sperm, Boost Immune System, Detoxifier/General Body Cleanser, Eye Cleanser/Correction, Energy Booster, General Body Weakness/Pains, etc. This Food Supplement is also a very good remedy to stroke patients. This is never a scam but more than a 100% real. We treat but Jesus Christ heals (Matthew 11:28). Why must you allow that affliction/ailment to ravage your body? Why not put an end to it today and enjoy health as destined to you by God? (3 John 2). With God all things are possible (Matthew 19:26). This Food Supplement is a well refined juice/Wine with pleasant taste and aroma. It has been introduced in the following areas in Benin City for further enquiries and investigations: Edo State Ministry of Education, Iyaro, Benin City; Edo State High Court, Sapelle Road, Benin City; Edo State Magistrate Court, Sapelle Road, Benin City; Federal High Court, Aduwawa-Auchi Road, Benin City; State and Zonal Immigrations, Benin City; State and Zonal Nigerian Security and Civil Defence Corps, Benin City; Radio Nigeria (Bronze FM), Aduwawa Road, Benin City; Edo State Broadcasting Service (EBS), Aduwawa Road, Benin City; Government House Central Administration, Benin City; Palm House, Sepele Road, Benin City; Edo State Secretariat, Sepele Road, Benin City; University of Benin (UNIBEN); Nigeria Army School of Supply and Transportation (S & T Barrack) Ishio, Benin City; etc. If interested, call Rev. (Dr.) Evang. Timothy Osemudiamen Okhomhen: 08051430395; 08035196707. Edo State Magistrate Court @ Cash Office, Sapele Road, Benin City, Mrs. Edomwande: 07057188702. Government House @ Women Affairs- Madam Beauty: 08033596212. Marketers and distributors are needed for wholesale purchase. For further details: Website: www.therhemadevotionals.org. Facebook: www.facebook.com/therhemadevotionals. Kindly lay your requests/complaints to: therhemadevotionals@gmail.com. Shalom!